Wailea Ekahi is the most reasonably priced of the Wailea ocean front properties. Clusters of 2 story buildings occupy just 10 of the 34+ acres of Ekahi creating a low density property with gorgeous tropical grounds. 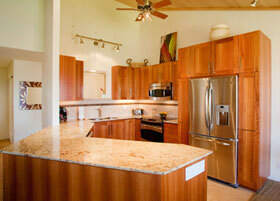 Condos at Ekahi are large (our 2-bedroom, 2-bath apartment is about 1500 sf including our lanais). Upstairs units like ours also have soaring ceilings. We are about one-third of the way up Ekahi's green belt and have fabulous, sweeping views of the ocean & neighboring islands. During most of the fall and winter months, we watch whales frolic in the warm Hawaiian waters off our beach. Throughout the time we've owned our condo, the focus has been on the tremendous view. Now, in 28D, you'll enjoy a complete interior remodel, with state of the art kitchen and baths, and new, wood beamed cathedral ceilings. The kitchen was a primary focus of our recent remodel. We removed walls and created an open, spacious work area with granite counters, lyptus wood cabinets & stainless appliances. Don't miss seeing our PHOTOS. Situated on 34 tropical acres, Ekahi's beautiful grounds are famous throughout the Islands. We keep books in our condo about Hawaiian flora, fauna, & birds so our guests can identify unique Hawaiian species. Our home is located in the lower village in one of the quietest spots at Ekahi, adjacent to one of 3 smaller, quiet pools. A four-minute stroll down the quiet, tropical, grassy, green belt from our 28D takes you to the ocean front beach pavilion and pool. Our beach, entered by a locked gate at this pool is Keawakapu - one of the best walking and swimming beaches on the island. 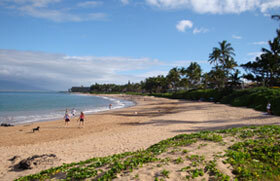 Great snorkeling is found 3 minutes south on the beach at Ulua beach. If unit is re-rented, a pro -rata refund will be issued less a 1 night administration fee. In case the unexpected occurs... We recommend trip cancellation insurance. All policies, rates & taxes are subject to change. all stays of 20 days or more. Copyright © 2010 MauiWaileaViewCondo.com All rights reserved.